Astoria-Pacific’s SPOTCHECK Analyzer automates newborn-screening tests for such diseases as: Phenylalanine, Tyrosine, Total Galactose and G6PD. Many of the tests, such as Biotinidase and Uridyltransferase, can be assayed from a single extracted blood spot. Using proven technology, marketed worldwide since 1989, samples can be quantitatively assayed and the results reported within the same day. No overnight incubation is required. The XYZ-format autosampler holds 4 microtiter trays, processing samples at an average rate of 90 per hour. Each test cartridge is specifically designed to manipulate the sample in an optimum way to generate a reliable, quantitative value, clearly separating “normals” from “positives” or “deficients”. As each sample passes through the cartridge, it mixes with the appropriate reagents and a fluorescent or colored product is formed. The sample continues to travel out of the cartridge and into a flow-through detector cell which measures the amount of fluorescence or color. The results are sent directly to a computer for data analysis. Abnormal results, or results that fall within an operator-selected range, can be flagged on the final report, using the FASPac software, and follow-up protocol can be initiated. Results can be saved and exported directly as Excel®, Lotus® or text files for easy integration with a LIMS. The SPOTCHECK diagnostic reagent kits are manufactured under the strictest standards. Convenient, color-coded kits provide enough reagents to analyze about 2500 or more samples and controls, and these kits are available with a 2-year shelf life. 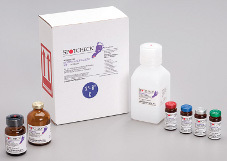 The SPOTCHECK reagent kits provide reliable, low-cost testing day after day. System purchase or reagent rental options are available for just pennies per test. If you are thinking of expanding your screening program, contact Astoria-Pacific for more information on evaluating the SPOTCHECK Neonatal Screening Analyzer.